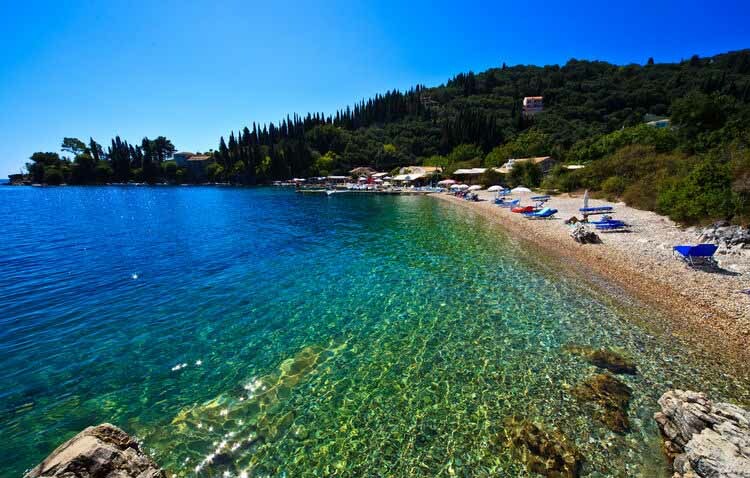 Paleokastritsa has separate bays with small picturesque beaches, located 16 km from Corfu Town on the northwest coast of the island. It is fully organized. It has blue flag. 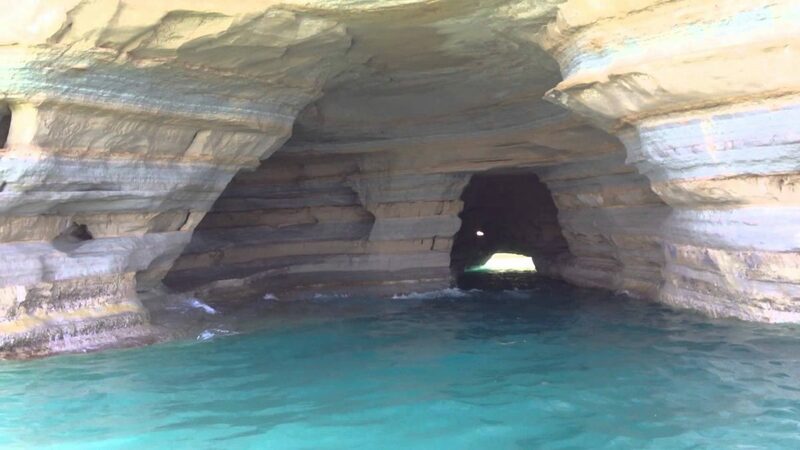 You can do water sports, rent boats for the wonderful beaches “Rovinia”, “Limni “, “Paradise / Homi”, ” Blue Caves” which have no road access or dive from «la Grotta». 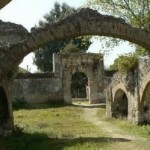 You can also visit the Monastery of Paleokastritsa and the fortress “Angelokastro”. 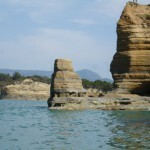 In Liapades there are two beaches with deep blue waters. 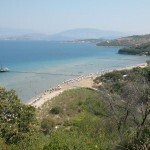 The beach of “Bridge/Gefyra” is the main beach of the village and it is very touristic and the second is “Rovinia”. 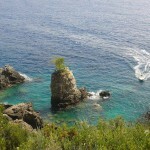 It is 20 km from Corfu Town and just a few kilometers from Paleokastritsa. 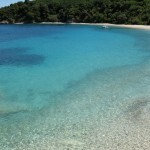 On the beach of “Bridge/Gefyra” you can also rent a boat to visit other beaches of Paleokastritsa. 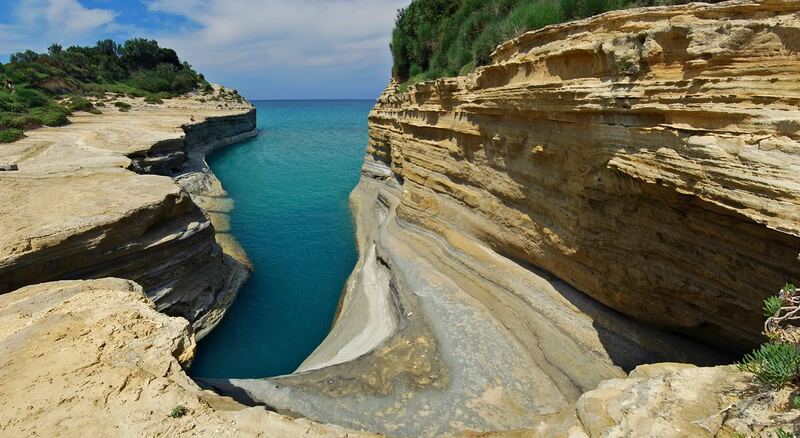 The beach of Agios Georgios Pagon is located 32 km from Corfu Town on the northwest coast of the island. 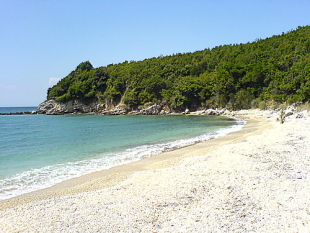 The beach extends about 3 km and has sandy coast and pebbles. 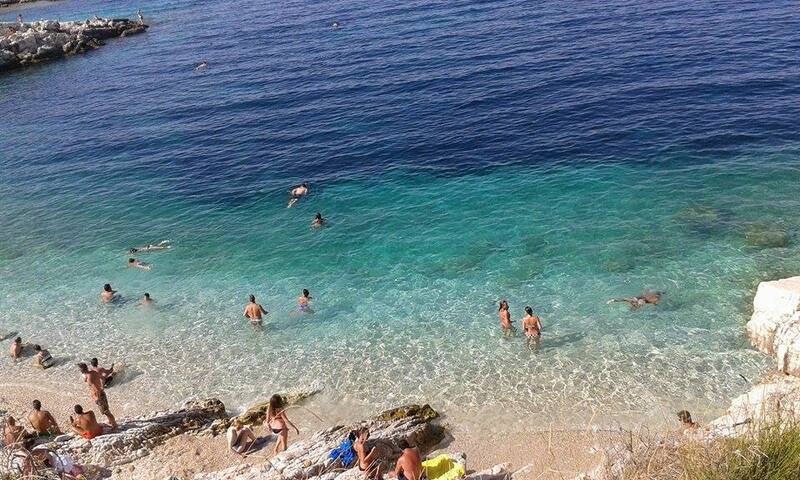 It has a blue flag and it’s famous for its cold water. 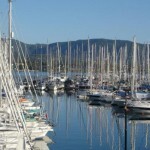 You can go by boat on a beach which is not accessible by car, called «Porto». 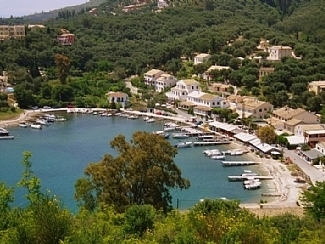 In the village of “Pagi” was filmed the movie «James Bond For your eyes only». 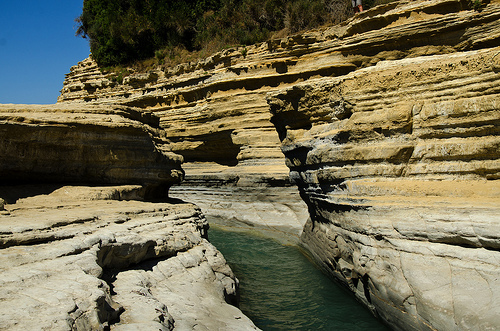 The unique complex of clayey rocks of the Canal d ‘amour at Sidari is located 33 km from Corfu Town on the north coast of the island. 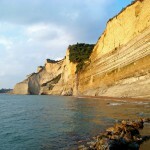 The beaches are forming separate bays with sand or pebbles. 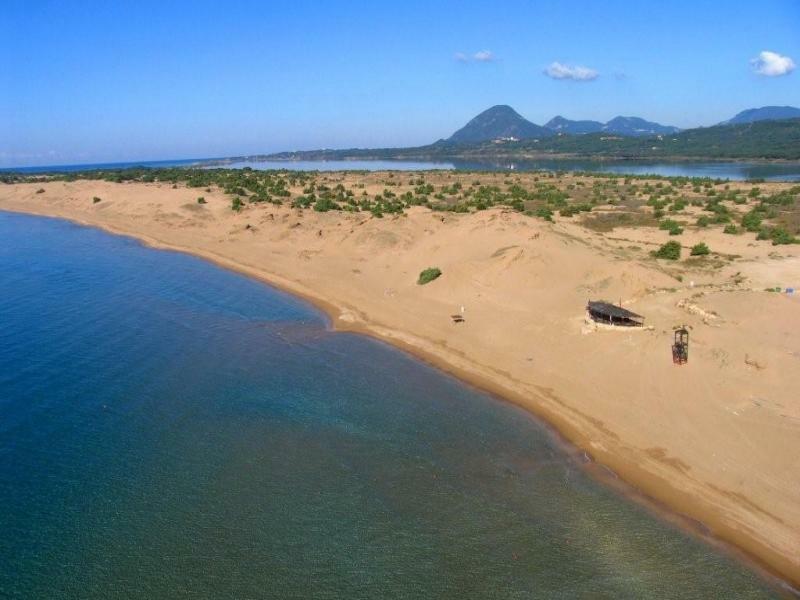 You’re able to make free spa using the muddy sand of the beach as an ointment for your skin. 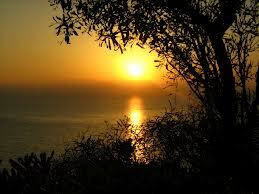 You can also enjoy beautiful sunsets. 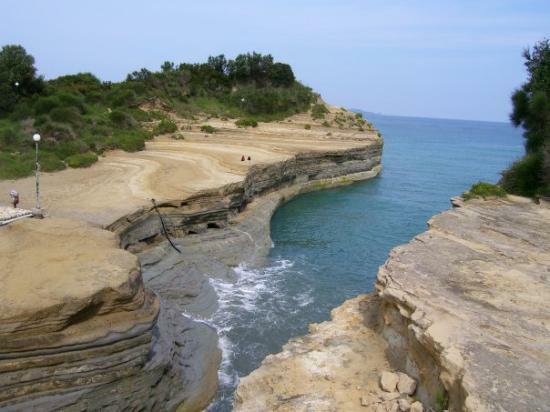 The picturesque beach Apotrypiti located near Sidari, 34 km. 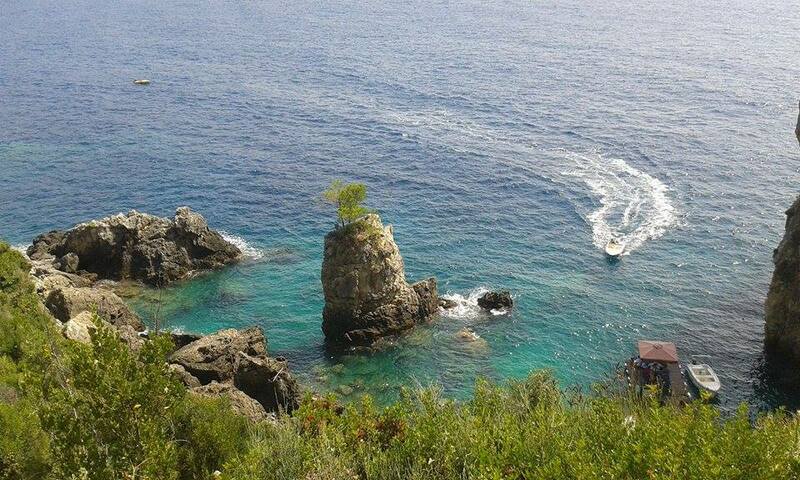 from Corfu Town on the north coast of the island. 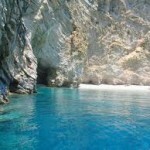 The beach is surrounded by massive rocks, extending over approximately 300m. and characterized by muddy sand. 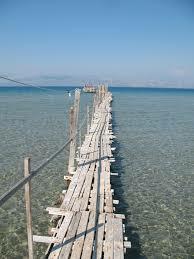 You’re able to make free spa using ointment for your skin of the muddy sand of the beach. 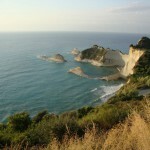 Cape Drastis is located 36 km from Corfu Town on the north coast of the island. 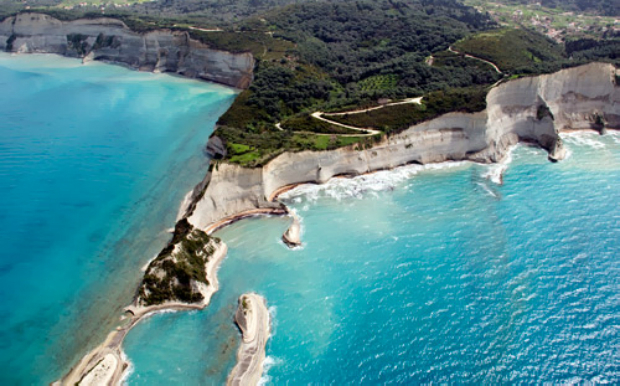 It is the northwestern edge of Greece. 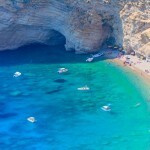 The beach is only accessible from the sea by boat. 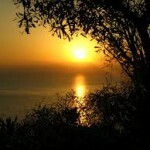 But you can visit the observatory on the edge of the hill, one of the most unique places that you must visit. 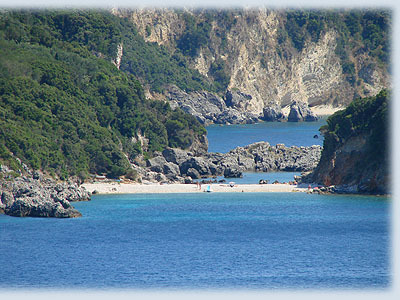 The beautiful beach Loggas is located 35 km from Corfu Town on the north coast of the island. 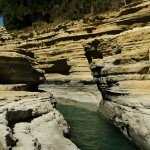 The beach is characterized by the natural beauty of rocks leading to a small sandy beach just 50 meters. 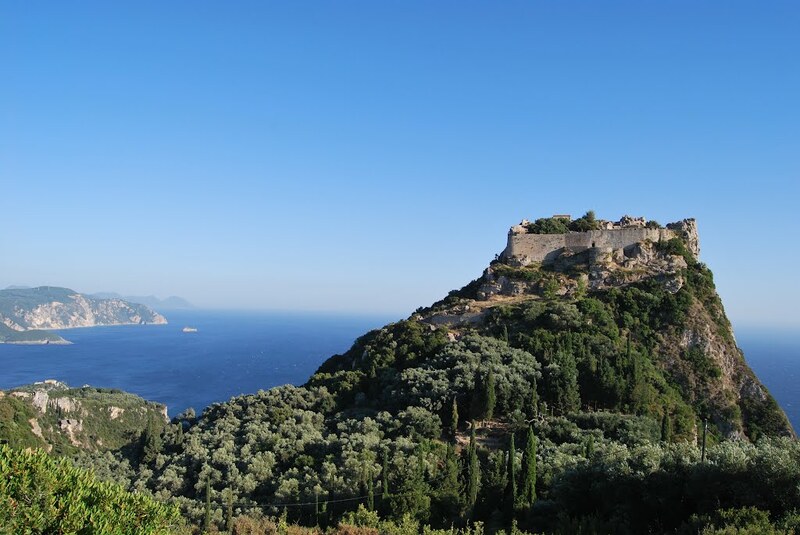 From the top of the hill you can enjoy a wonderful view of the deep blue and the outlying Islands and one of the most beautiful sunsets of the island, combined with great food and drink. 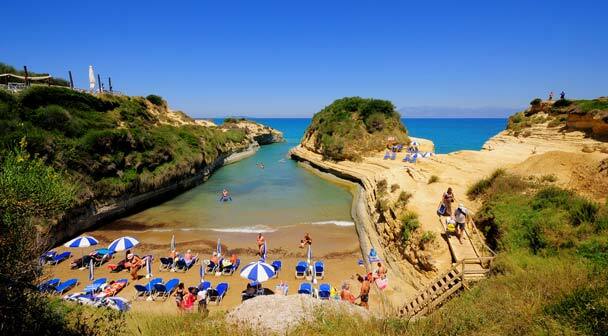 The beach of Roda is 32 km from Corfu Town on the north coast of the island. 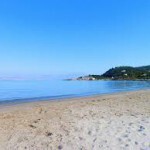 The beach extends approximately 2.5 km and has a sandy shore. It has a blue flag and is well organized. 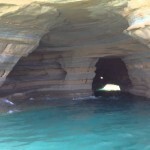 It is ideal for families with children, because the water is very shallow. 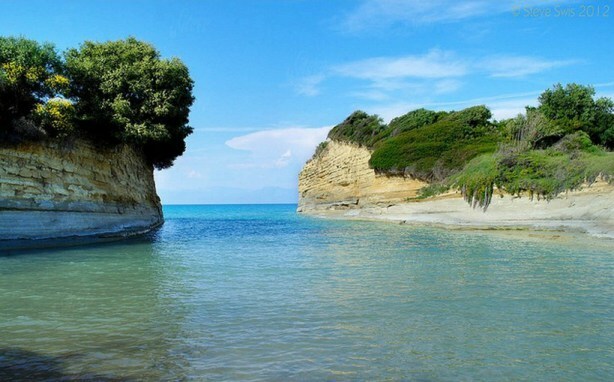 The beach of Acharavi is 45 km from Corfu Town on the north coast of the island. 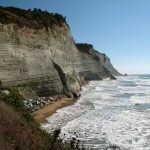 The beach extends about 5 km and is characterized by the dissimilarity of the coast. It has a blue flag. 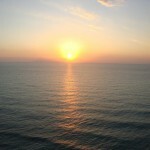 It is well organized, the parking is easy, and there are several restaurants, cafes and snack bars by the sea. 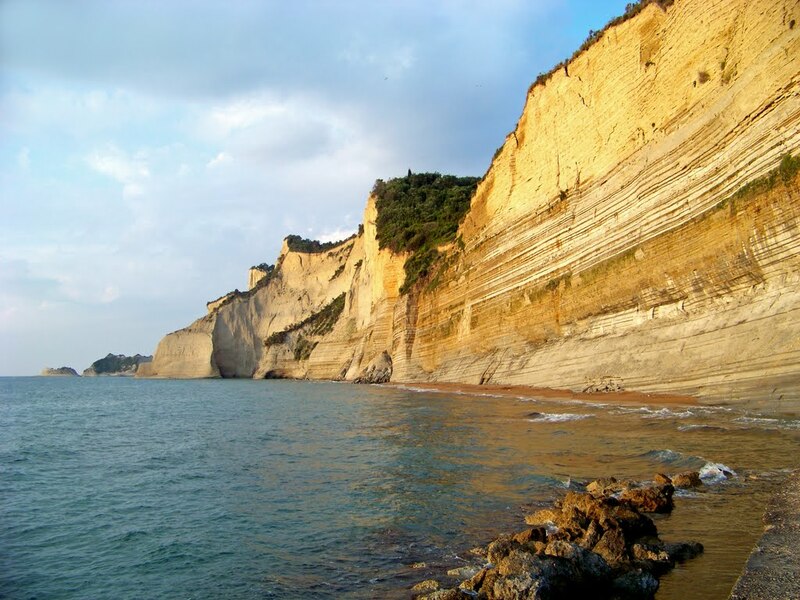 The beach of Agios Spiridon is located 36 km from Corfu Town on the north coast of the island. It has a blue flag. On the left side of the church it is the main beach, the lake Antinioti, and the isolated beach ‘Gialiskari’. 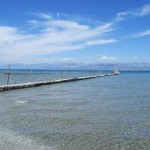 On the right side of the church and after the bridge there are three other gulfs the main of them is called “Molos Beach”. 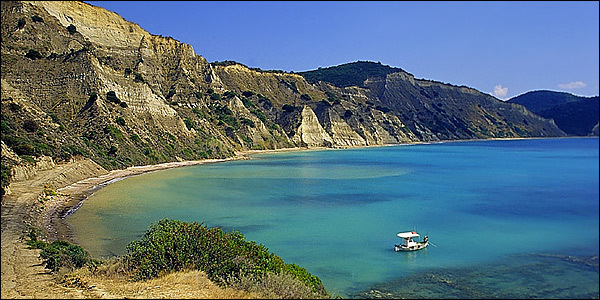 Kalamaki beach is located 37 km from Corfu Town on the north coast of the island. 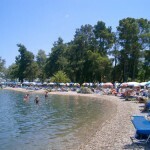 The beach extends approximately 2.5 km and is sandy. It has a blue flag. 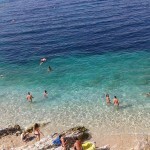 It is ideal for families with children, because the water is very shallow. 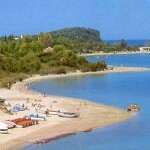 Avlaki beach is located 32 km from Corfu Town on the northeast coast of the island. 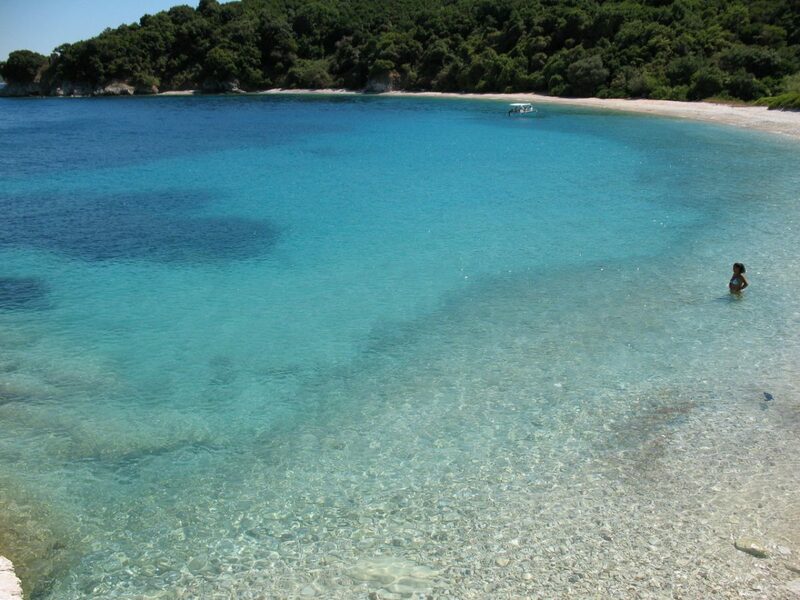 The beach extends approximately 1.5 km and has pebbles. 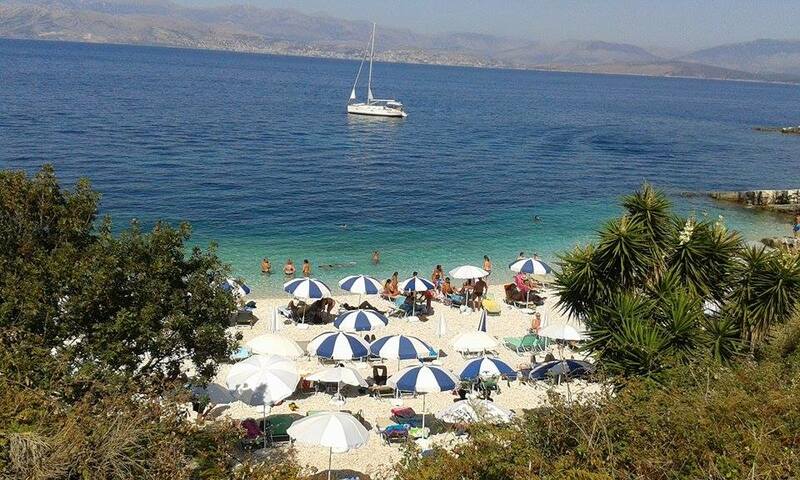 It is an organized beach. 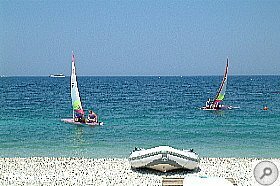 On the beach you can do water activities such as pedals, sailing or surf. 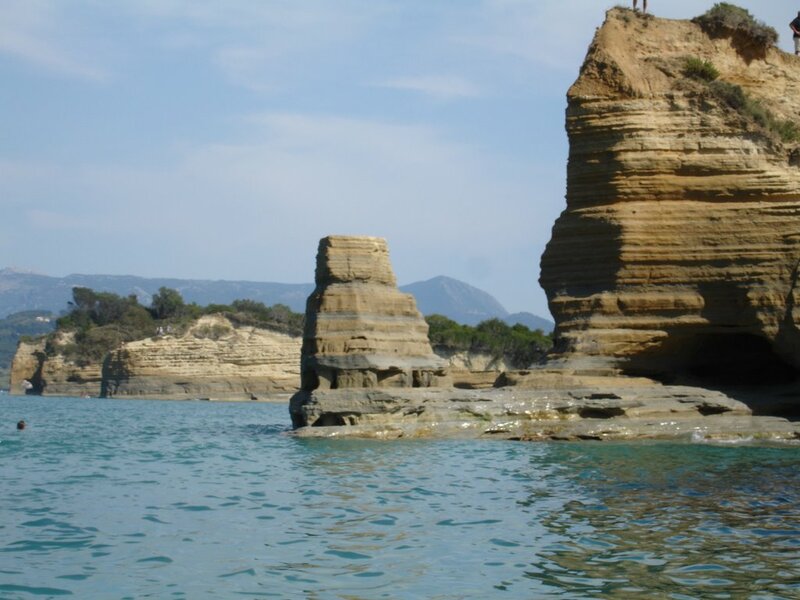 You can also enjoy a ride at “Erimitis”, a protected area of ​​natural beauty or walk to the lovely beach “Limnopoula – Akoli”, perhaps one of the few isolated beaches. 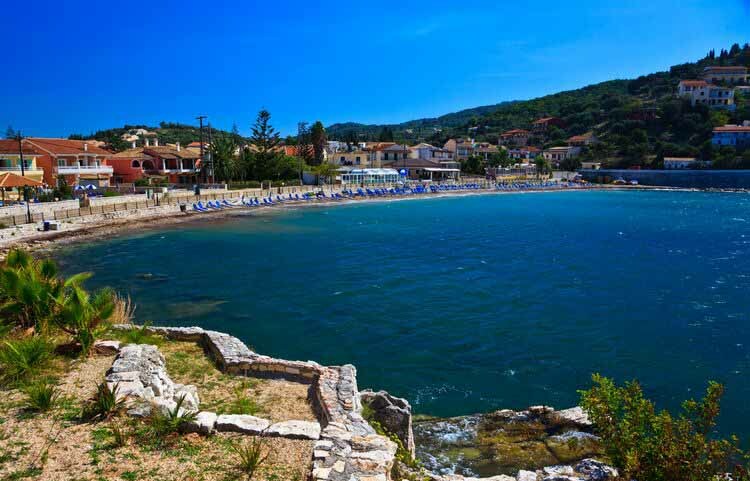 In Kassiopi there are 2 main beaches: the first one “Imerolia” with pebbles on the left side of the island has a large width. 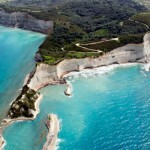 On the other hand “Bataria Beach” is behind the cape and is surrounded by small gulfs. 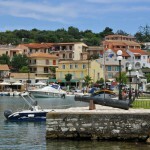 Kassiopi is a beautiful harbor where you can make guided excursions to beaches and blue caves. 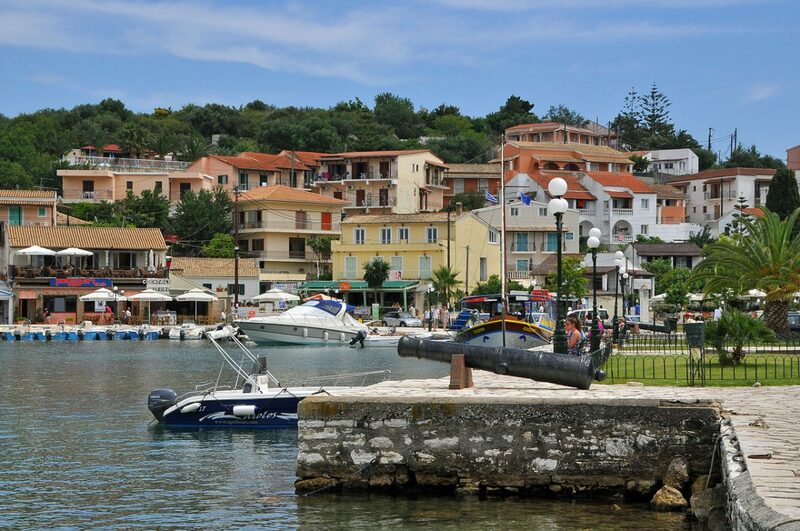 Agios Stefanos Sinion is a natural harbor for small boats. 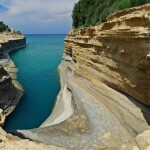 It is located 28 km from Corfu Town on the northeast coast of the island. 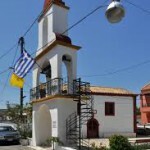 The coast is along the village of Agios Stefanos Sinion and is famous for its fresh fish. 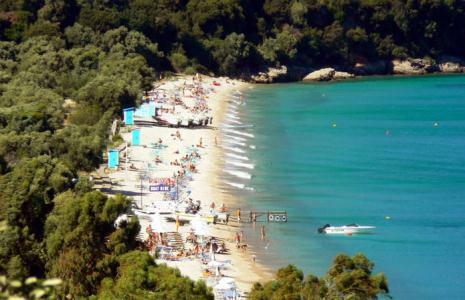 About 1 km from the Gulf of Agios Stefanos, the beach “Kerassia” is located 30 km from Corfu Town on the northeast coast of the island. 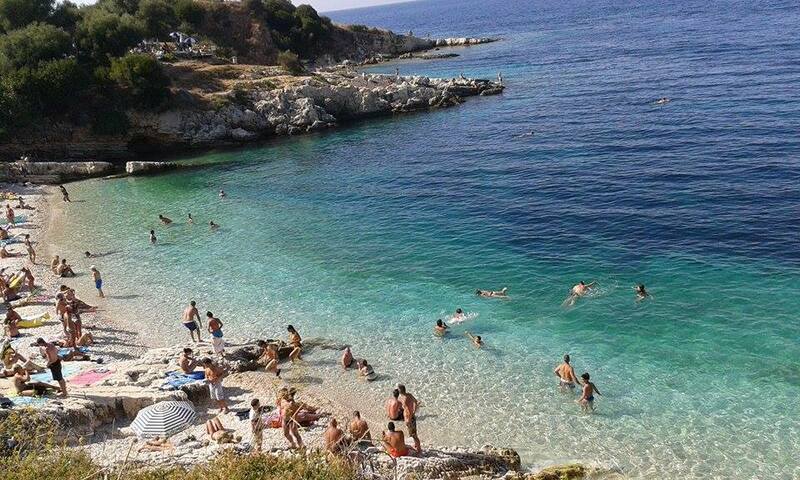 The beach extends approximately 1.5 km and is characterized by pebbles, crystal clear waters and a blue flag. 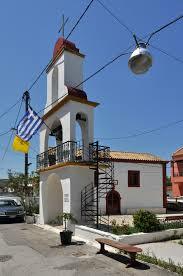 Access is only by the road to Agios Stefanos Sinion. 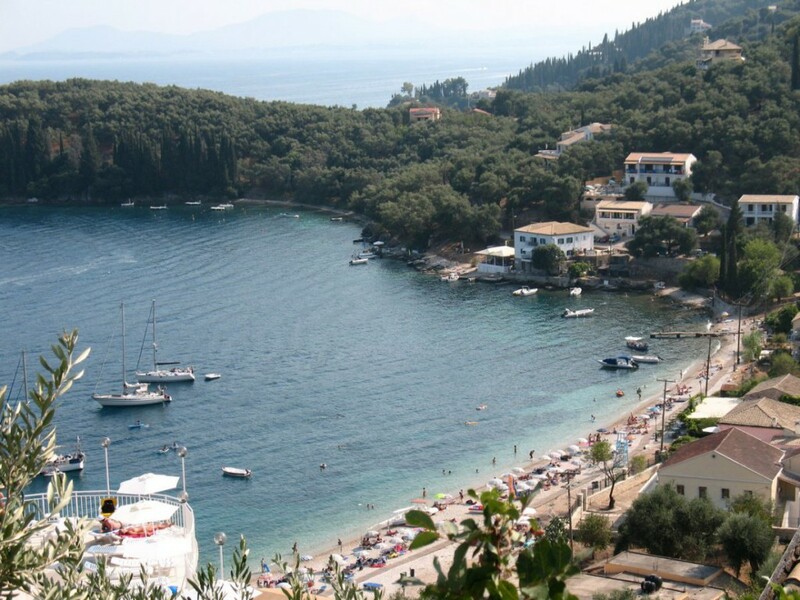 Kouloura it is on the right side of the beach “Houhoulio” and has a port for small boats. 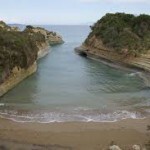 The semicircular shape of the small bay gave its name to the beach. 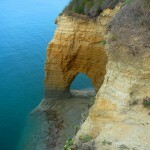 It is located 26.5 km from Corfu Town on the north east coast of the island. 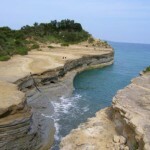 The deserted beach Houhoulio extends approximately 1km and has large pebbles and sandy coast. The beach is beautiful but not organized. 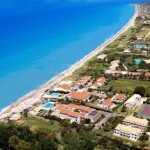 In this region there is also the villa of Agnelli, where occasionally are hosted celebrities and royalties from around the world. 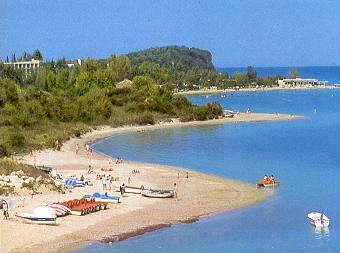 Kalami Beach is located 26 km from Corfu Town on the northeast coast of the island. 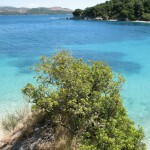 The beach extends about 1 km and is pebbly with clear, turquoise waters and a blue flag. 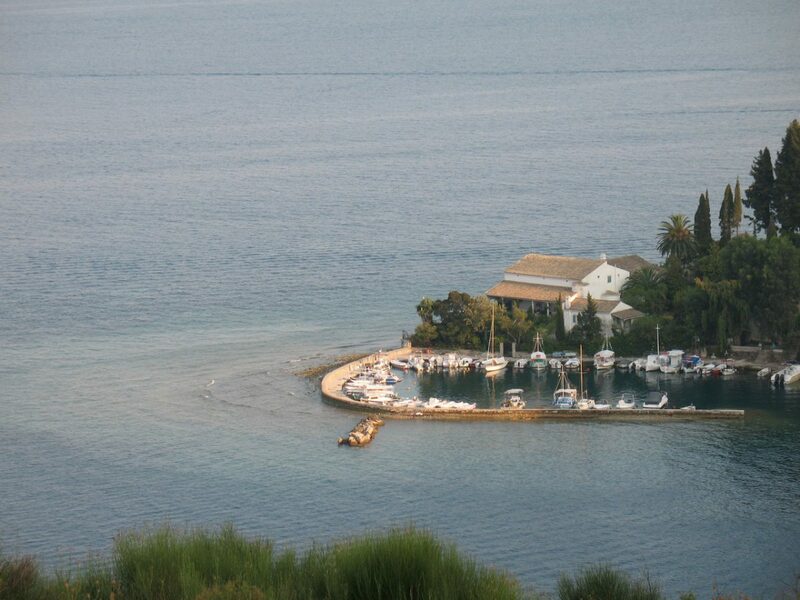 Kalami is known from the proposed by Nobel Prize author Lawrence Durrell, who lived in the White House, where the «Prospero’s Cell» was inspired. The White House is still maintained at the end of the beach Road from the early 20th century. 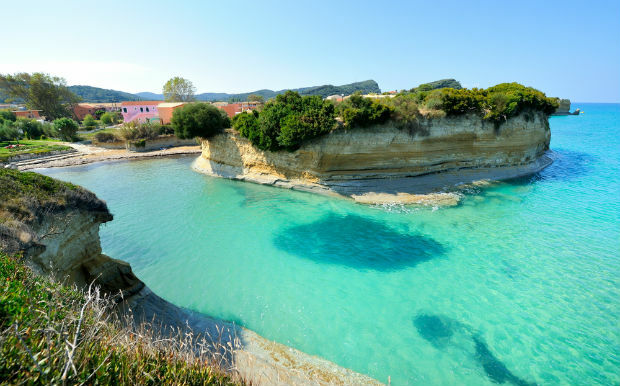 Agni is a beautiful fishing village with a quiet beach and is located 24 km from Corfu Town on the northeast coast of the island. 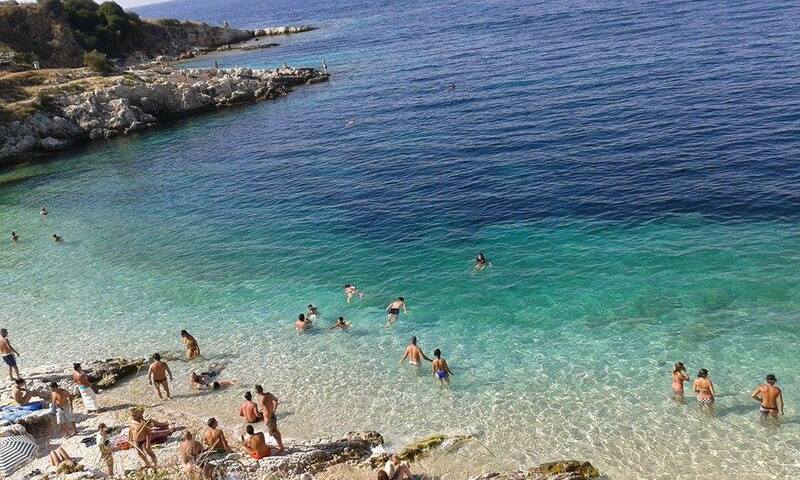 The beach extends approximately 1.5 km it’s pebbled with crystal clear turquoise waters and a blue flag. 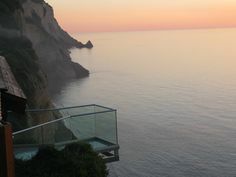 There are three fine restaurants, but they are only open during the summer season. 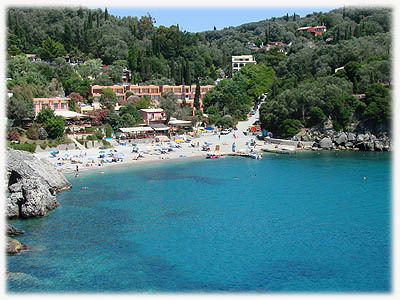 The beach Agni is preferred as a destination for small boats. 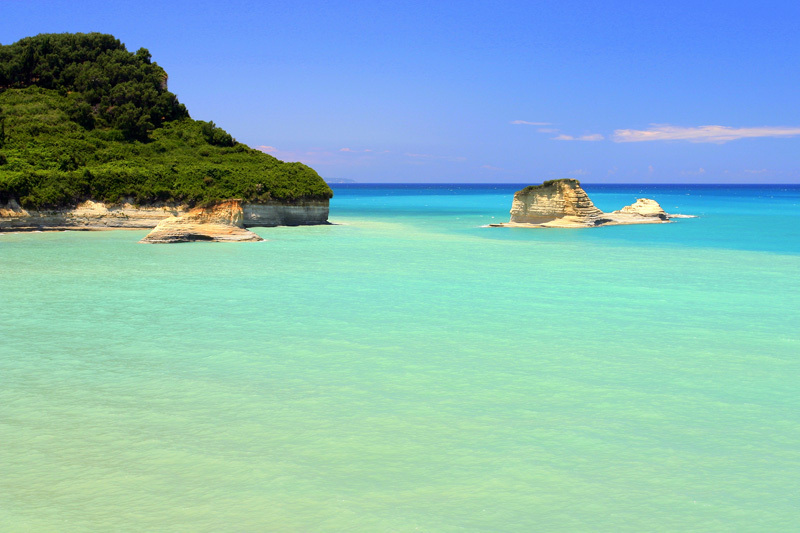 Nissaki Beach is located 19 km from Corfu Town on the northeast coast of the island. 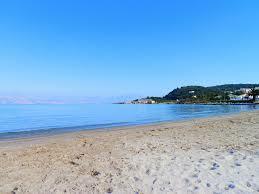 The beach extends over approximately 0.5 km and it’s sandy with small rocks. 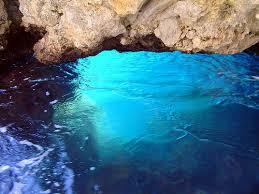 It has a blue flag and crystal blue waters. 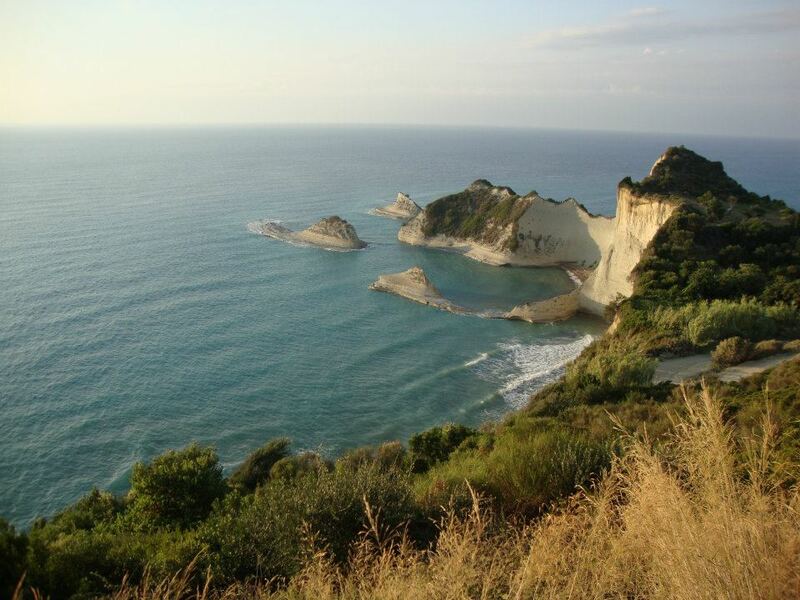 The beach of Barbati is located 17 km from Corfu Town on the east coast of the island. 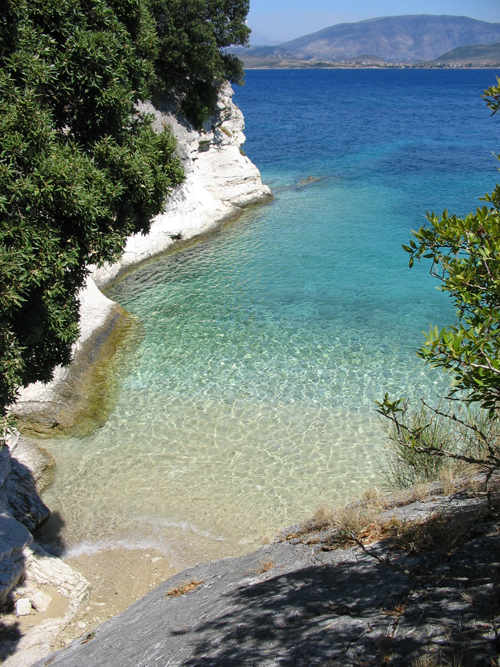 The beach extends approximately 2 km and is pebbly. It has a Blue Flag. 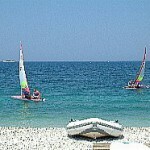 It is well organized and you can do water sport. 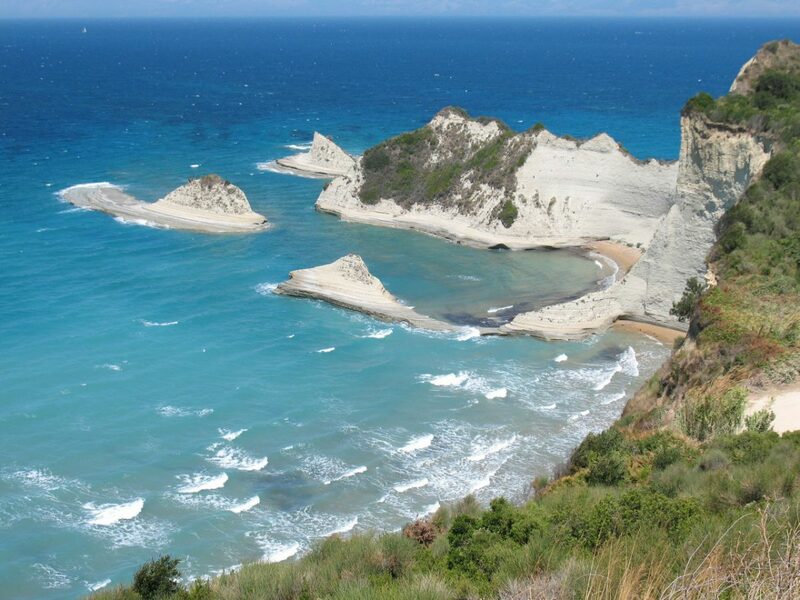 The Ipsos beach is just 9 km from Corfu Town on the east coast. 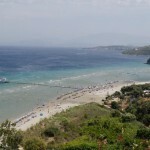 The beach extends approximately 2.5 km. 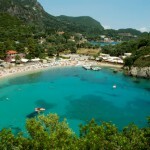 It has a sandy coast and a Blue Flag. 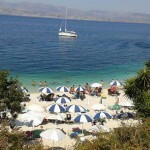 It is well organized and is popular for its nightlife. 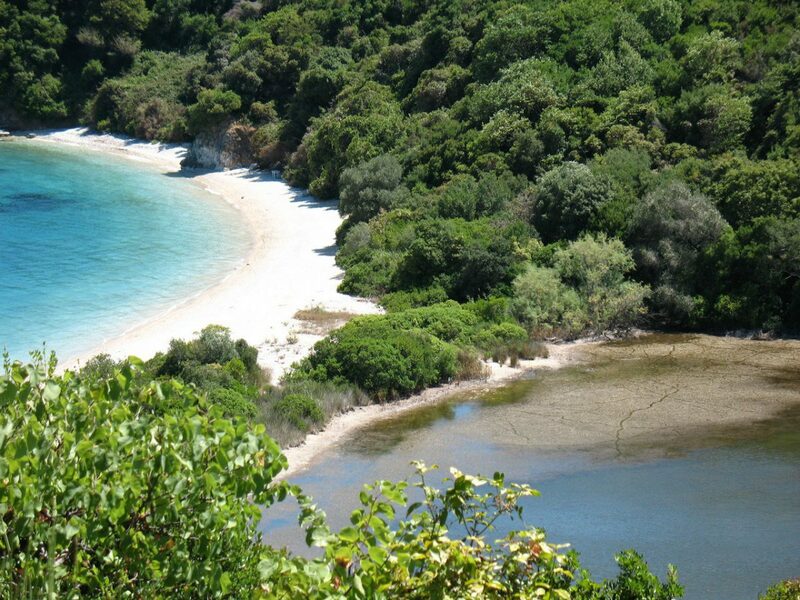 The beach of Gouvia is just 6 km from Corfu Town next to the Marina of Gouvia, on the east coast of the island. 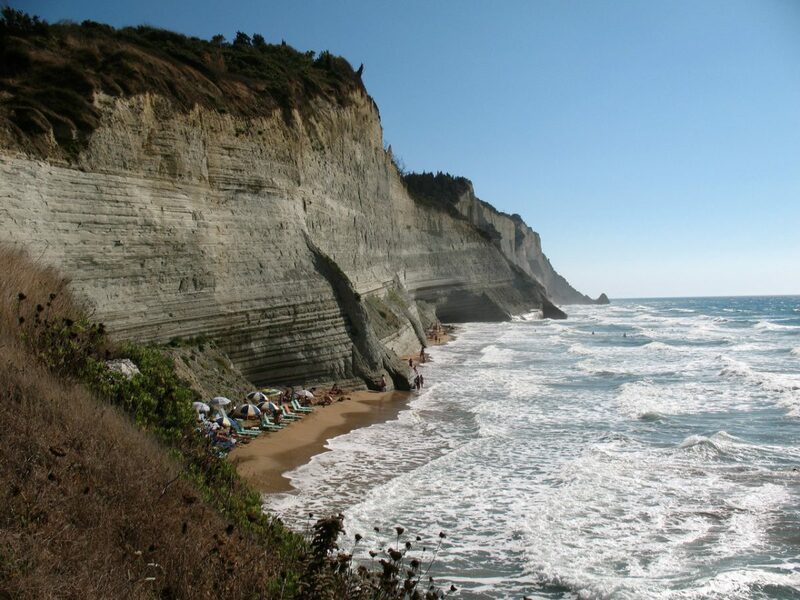 The beach extends approximately 2.5 km and is characterized by pebbles and sand. 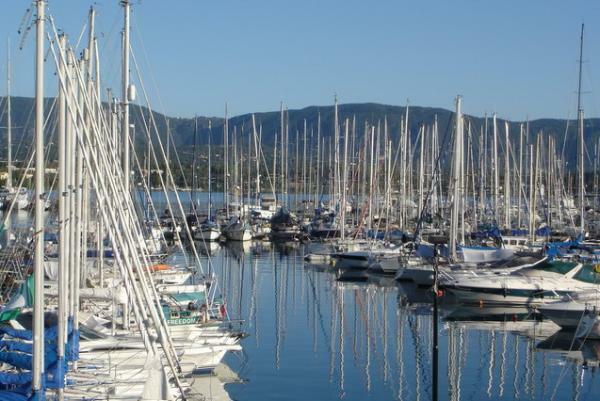 Also there is the Venetian shipyard built in the western side and is called Govino Bay, the current location of the village of Gouvia. 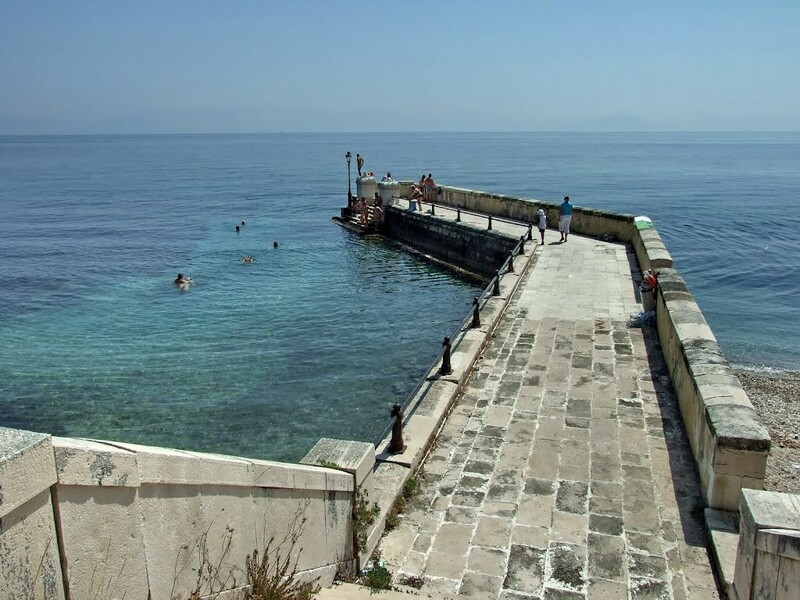 The remains of the old Arsenal are still on Gouvia Bay, located about 8 km from Corfu Town. 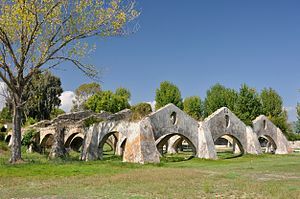 The ruins are behind the modern marina of Gouvia. 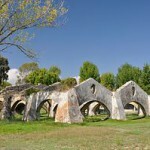 The columns, walls and arches of the Arsenal have survived almost intact, but the roof is missing. 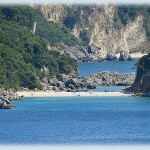 The beach “Agios Gordios” is located 11 km from Corfu Town in the western part of the island. 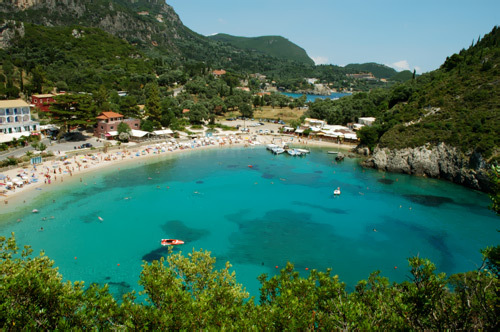 The beach extends approximately 1.5 km and has a golden sandy shore and a Blue Flag. It is well organized and also has a beach volley area. 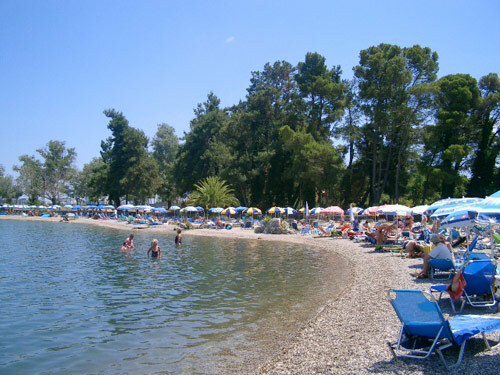 The cosmopolitan beach of “Glyfada” is 7 km from Corfu Town in the western part of the island. 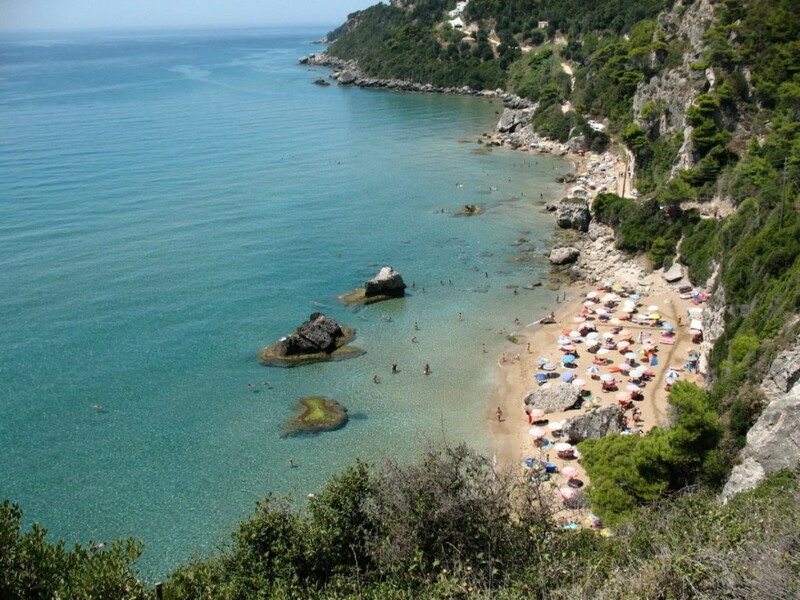 The beach extends approximately 2.5 km and has a golden sandy shore and a Blue Flag. 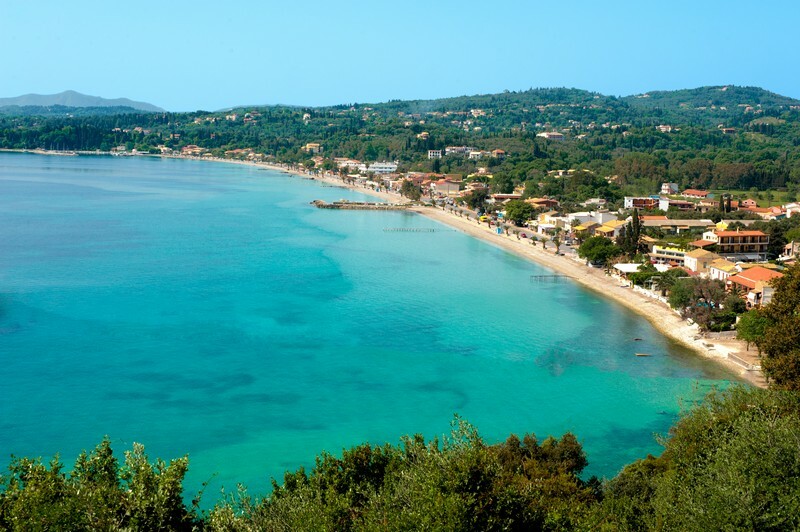 The beach of Glyfada is one of the most famous beaches of Corfu and is fully organized. 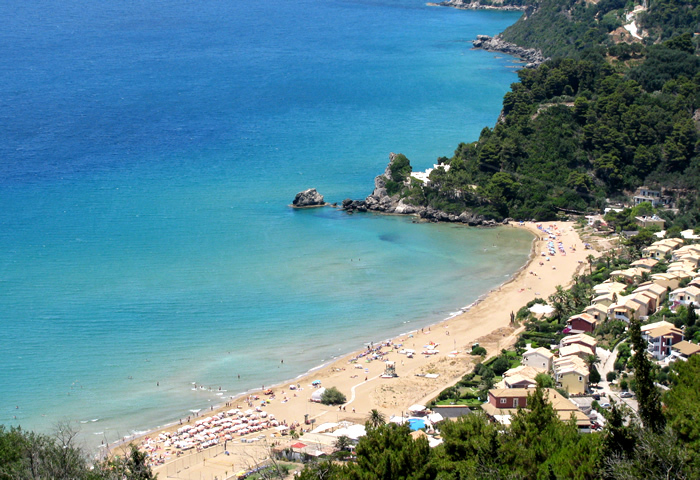 The beach of Myrtiotissa is 8 km from Corfu Town in the southern part of the island, close to “Glyfada” beach. 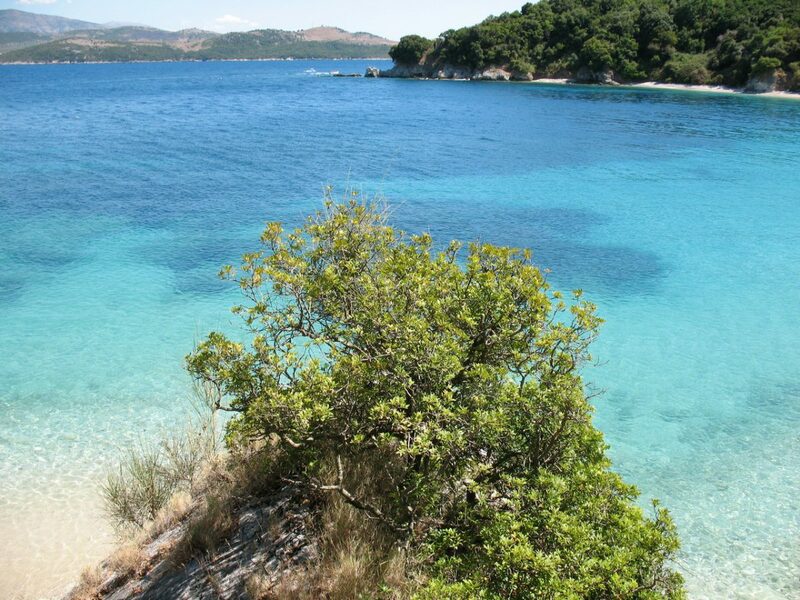 The beach extends approximately 1.5 km and has a sandy beach with turquoise waters. It took its name from the monastery nearby. 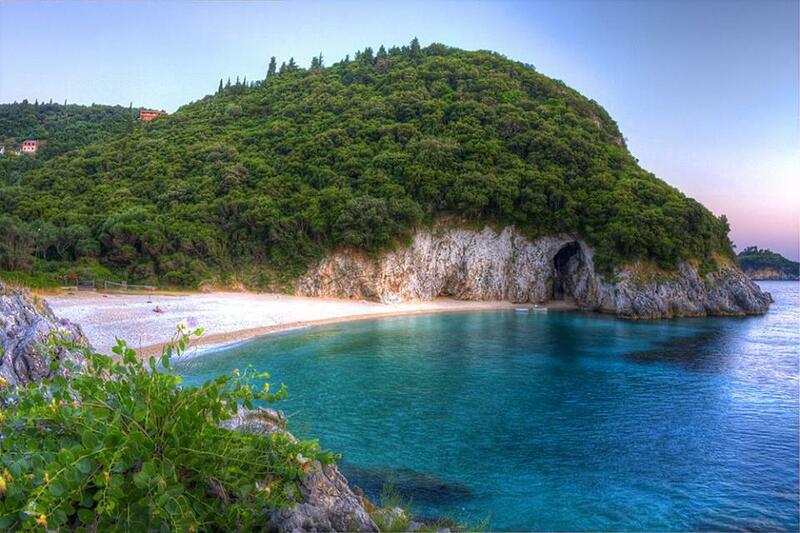 It is an organized beach. The access is difficult due to the steep slope of the road. 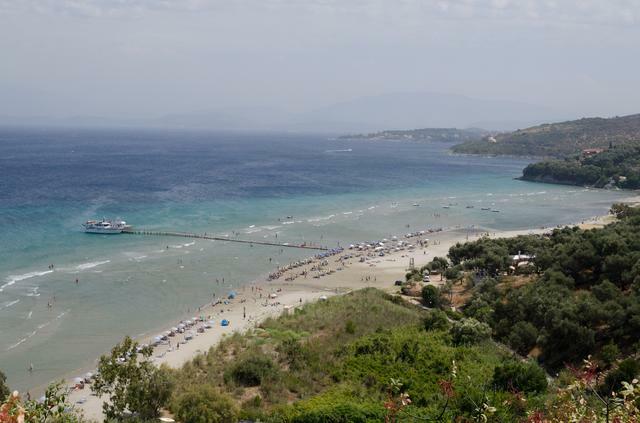 You can get to the beach by car but you must leave your car and go down to walk a distance of 500 m. This beach is frequented by nudists. 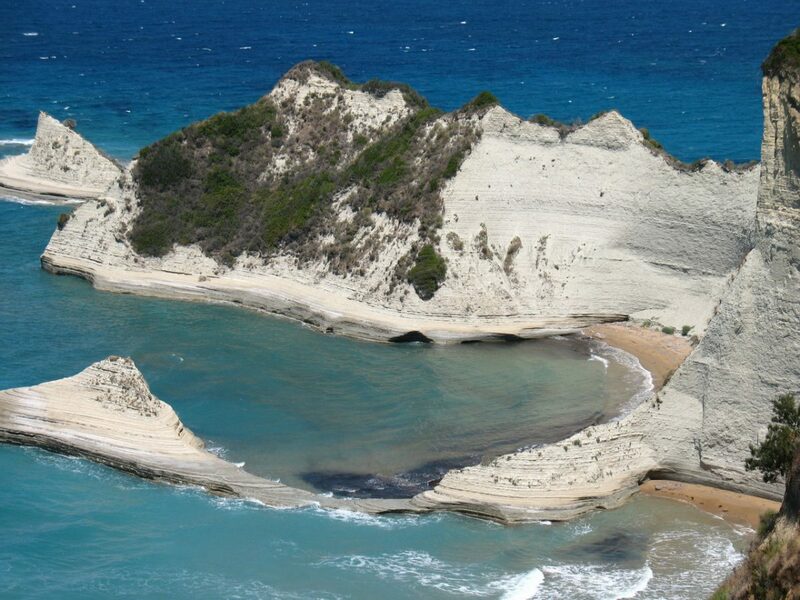 The “Ermones” beach of Corfu is a place of myth and legend. 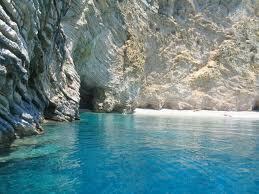 It is the place where Nausica found the shipwrecked Odysseus. 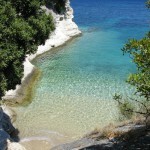 The beach “Ermones” is 20 km from Corfu Town in the western part of the island. 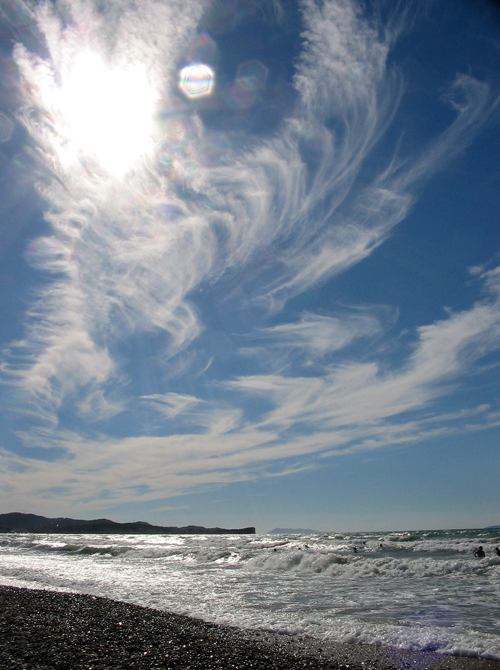 The beach spans approximately 2 km and has a sandy coast and a Blue Flag. 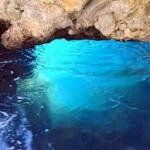 There is an excellent diving center where you can start an amazing trip to the wonderful and rich spectacle bottom of the sea. 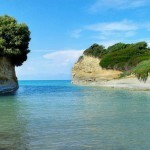 The beach “Kondogialos” is 5 km from Corfu Town in the eastern part of the island. 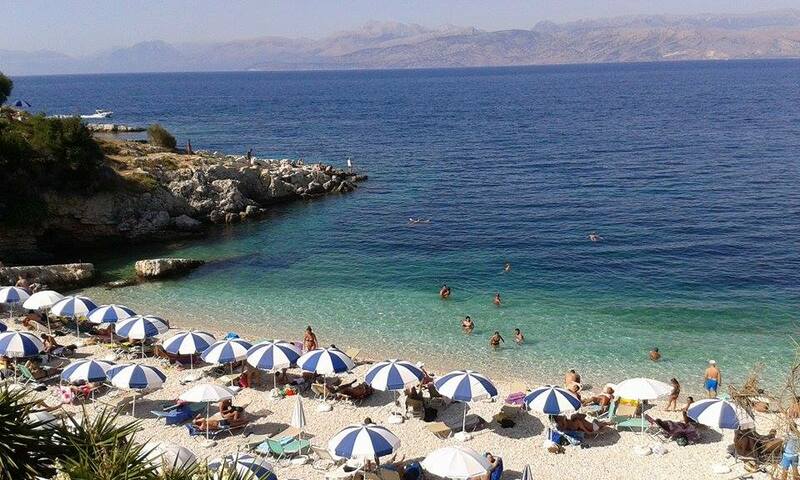 The beach extends approximately 2.5 km and has a golden sandy shore and a Blue Flag. 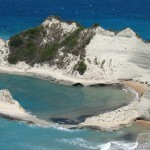 It is one of the most famous beaches of Corfu and is fully organized. 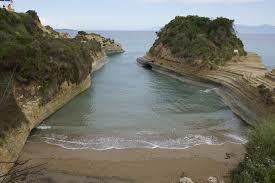 The beach with the “Kaiser Bridge” is 11 km from Corfu Town in the southeastern part of the island. 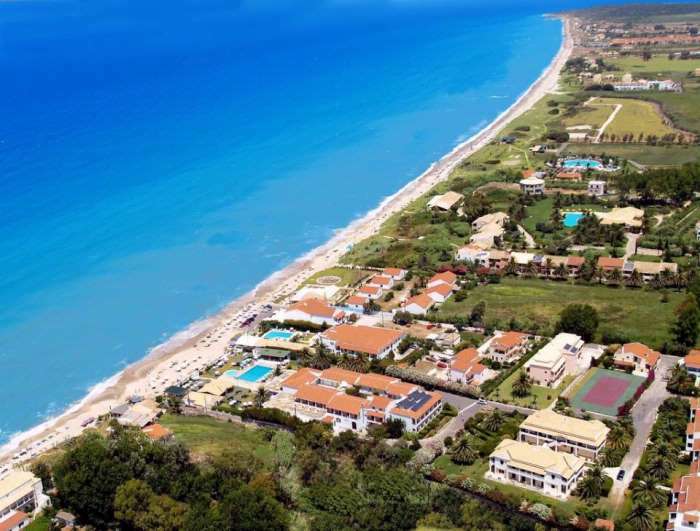 The beach extends approximately 1km, has pebbles and is an organized beach. 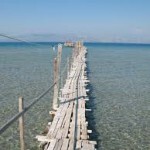 The Kaiser Bridge connects Achillion with the beach. 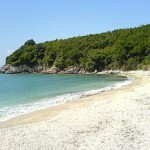 The beach “Benitses” is 12 km from Corfu Town in the southeastern part of the island. 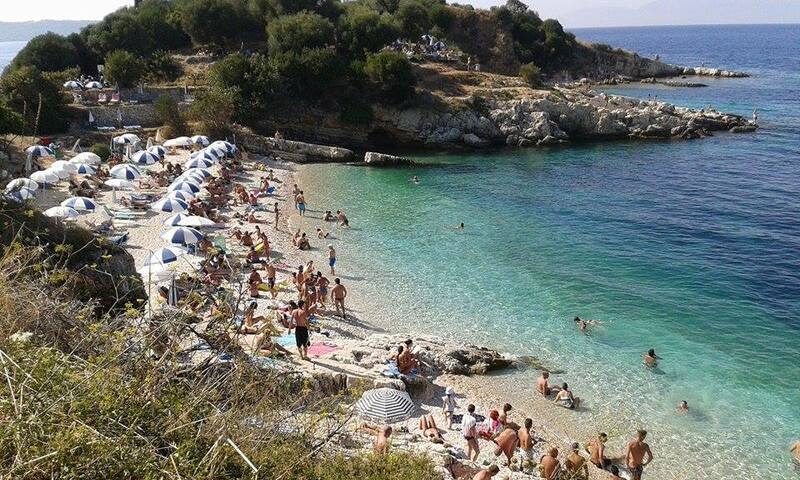 The beach stretches about 0.5 km and has pebbles, a Blue Flag and is well organized. 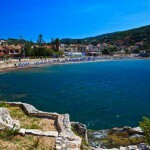 The beautiful beach «Santa Barbara or Maltas” is 39 km from Corfu Town in the southwestern part of the island. 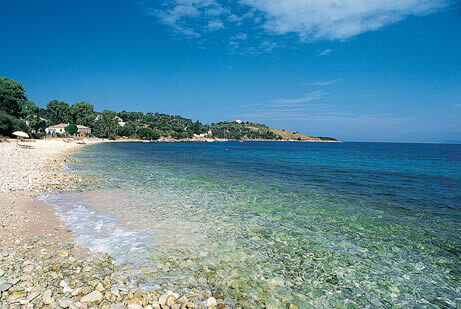 The beach stretches about 3 km and has a wide sandy shore. It is fully organized. 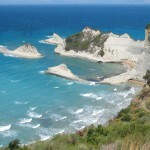 The beach “Marathias” is 34 km from Corfu Town on the southwest coast of the island. 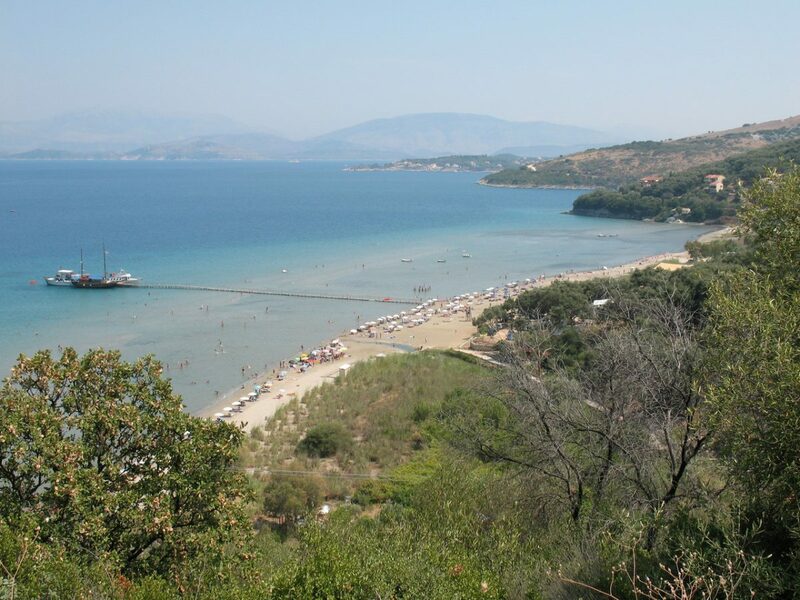 The beach extends approximately 2.5 km, it has a sandy shore and it’s fully organized. 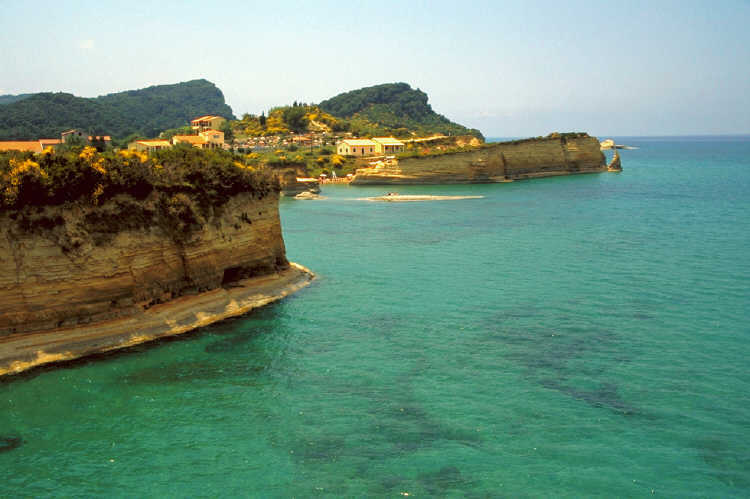 The separate beach Issos is 30 km from Corfu Town in the southwestern part of the island. 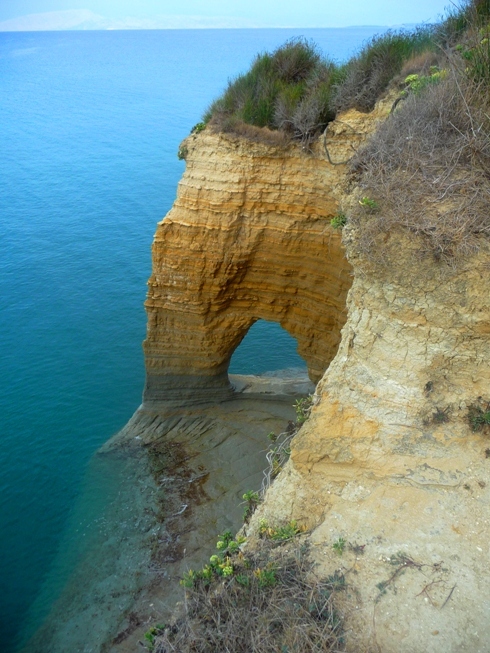 It spans about 2.5 km and has a sandy beach with sand dune formations and a Blue Flag. 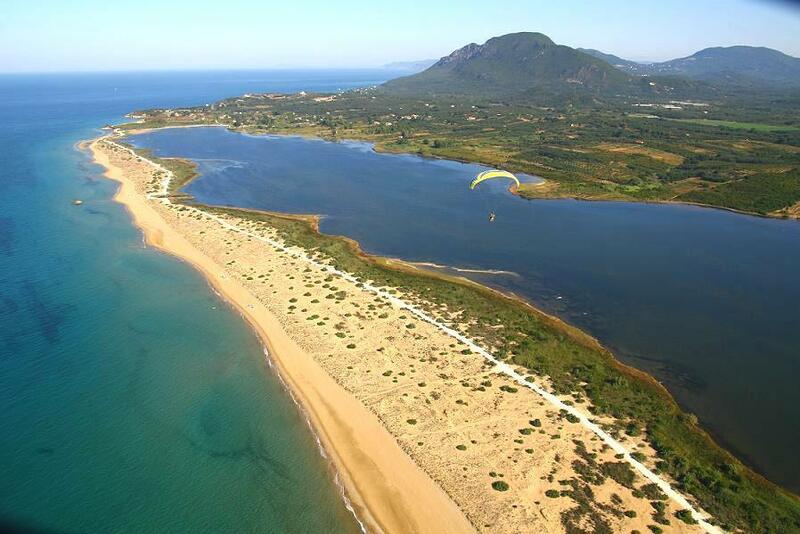 It consists an endless sandy beach with its unique Mediterranean sand dunes, the ‘forest of cedars’ and finally’ Korission Lagoon “. 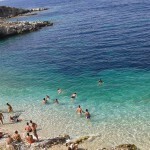 The clear water and the sandy beach offer a safe playground for children. 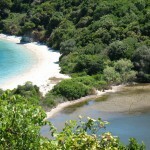 The area is protected (Natura 2000) and this is why the beach is not organized. 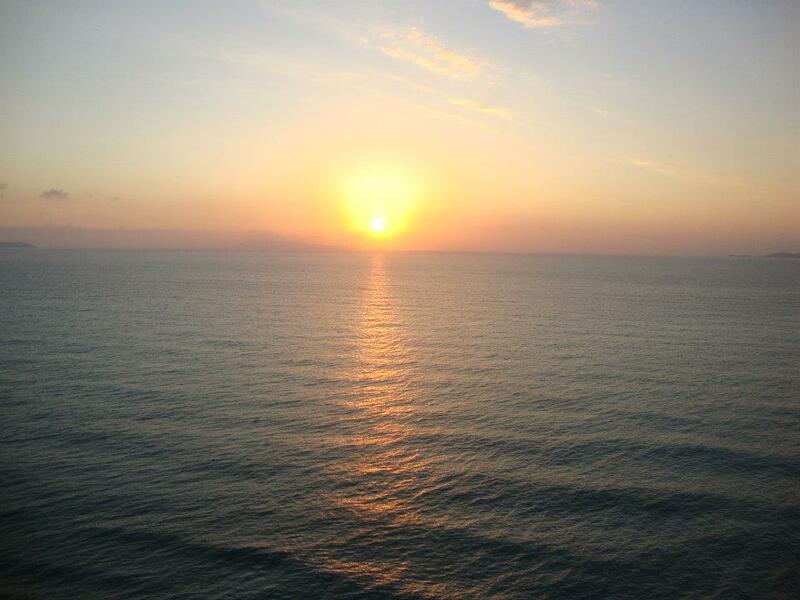 Do not miss the sunset over the sand dunes. 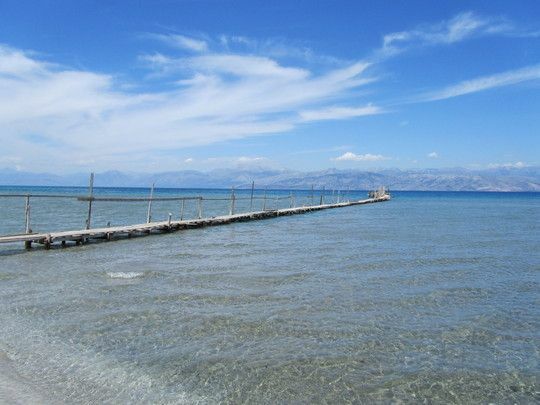 Chalikounas is the beach strip that separates the Korission Lake from the sea. 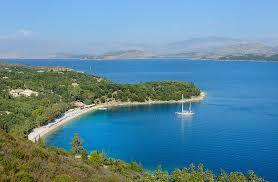 In fact, there are two beaches between the lake and the sea the Halikounas and Issos. 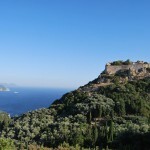 It is 26 km from Corfu Town in the southwestern part of the island. 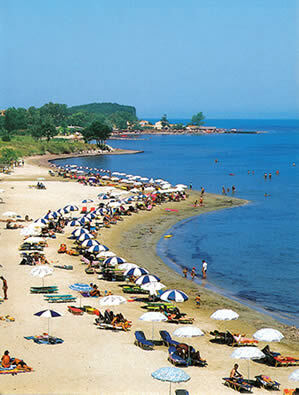 The beach stretches about 4.5 km and has a sandy shoreand a Blue Flag. 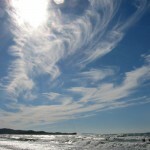 It is popular at surfers and kite surfers because of the winds that blow frequently in this part of the island. 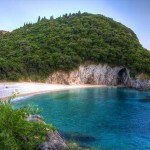 The beach “Kavos” is 48 km from Corfu Town in the southern part of the island. 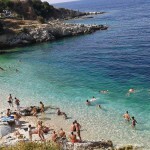 The beach extends approximately 2.5 km and has a sandy shore. 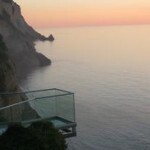 The place is very famous for its nightlife.